This independent industry event – brought to you by the internationally renowned Information and Records Management Society – provides a perfect opportunity for learning, sharing and networking across this important and vibrant sector on the eve of GDPR. Under the central theme of ‘Back to the Future: From Best Practice to Innovation’ the 2018 programme will cover key areas, via a unique combination of keynotes, workshops, case studies and discussion panels. Visit us Today at the IRMS Conference on Stand 19, for your chance to win a bottle of Prosecco. 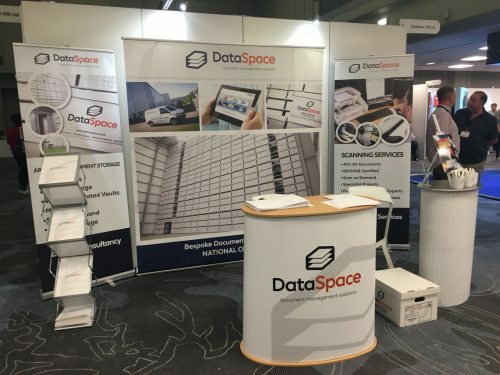 DataSpace the Professional Records Management provider offers bespoke Records Management Solution packages for businesses and organisations who require to reduce costs, streamline and improve their current document management/storage procedures and comply with best practice and Data Protection legislation.